The Fourth Album, Runes, Four Symbols, The Untitled Album – the title of Led Zeppelin’s 1971 LP has had fans and critics scratching their heads in confusion for nearly half a century. The album’s ambiguous name stemmed from the not-so-stellar reception from their previous effort Led Zeppelin III, with Jimmy Page refusing to do any press tours for 18 months after the third album’s release. By neglecting to put any branding (or any written information at all) on the album’s packaging, Page, Robert Plant, John Paul Jones and John Bonham wanted the tracks on Led Zeppelin IV to speak for themselves. 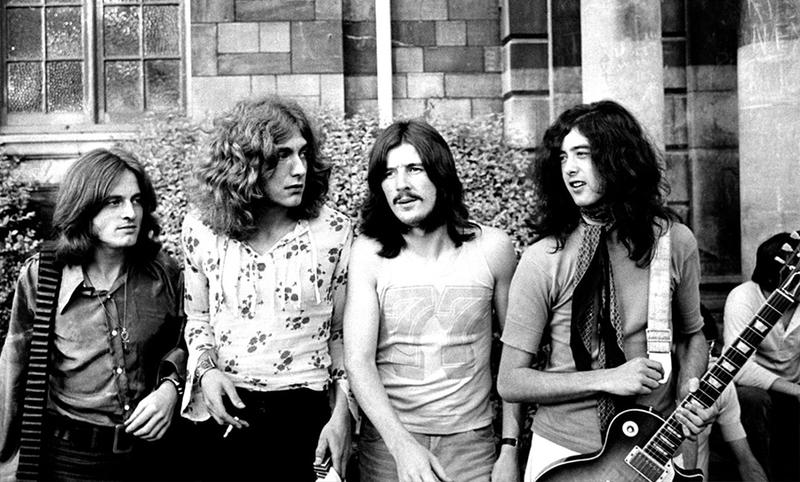 While this was initially met with hesitation from Atlantic Records, the decision proved to be a wise one as the 1971 album became not just Led Zeppelin’s highest-selling LP, but one of the best-selling albums of all time. Born out of months of unbridled experimentation and fierce determination, Led Zeppelin’s fourth album is one of the high points of the rock canon. Here’s what went into its creation. Following the release of Led Zeppelin III in October 1970, the band took an extended break from performing live to begin planning a blueprint for their follow-up LP. With their first two albums, the writing process had been heavily dominated by Page, but by their third album, the band had adopted a more democratic method, and so all four members retreated to the Welsh cottage Bron-Yr-Aur to hunker down and write. As the band were gearing up to put their new compositions onto tape, engineer Andy Johns – who had worked with Led Zeppelin on their last record – suggested to Page that the band utilise the Rolling Stones Mobile Studio, the first mobile recording facility in Europe. So after some deliberation, Page decided that the band would set up the mobile recording studio at Headley Grange, a former poorhouse in Hampshire, with additional overdubs taking place at Island Studios in London. The tranquil surrounds of Headley Grange proved to be immensely beneficial for the band. The set-up of the country estate and the mobile recording studio allowed them to soak in the natural surrounds for inspiration, as well as spontaneously record takes when necessary. And with no bars, pubs, or any other distractions on offer close by, the remoteness of the location forced all members of the band to focus purely the album. The record kicks off proceedings with Black Dog, a rollicking tune boasting a winding main riff penned by bassist John Paul Jones that showcases the raw and gritty snarl of Page’s Les Paul. 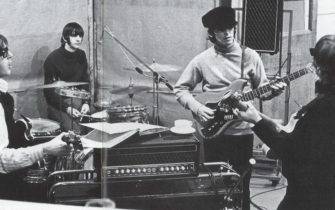 The iconic tones were created by double and then triple-tracking the guitar parts for the thicker sound. Johns ran Page’s Les Paul directly into the mixing console and utilised two Universal Audio 1176 compressors in series to drive the guitars. While Page used his Les Paul heavily on LZIV, he also experimented with old and new guitars he’d collected over the years. For the piercing slides on When The Levee Breaks, he used a 1961 Danelectro 3021/DC59, while on the grandiose Stairway To Heaven, he pulled out a Vox Phantom and Fender Electric XII for the verses, as well as his old Fender Telecaster for the iconic solo. The album continued to showcase a softer side of the band and included two solely-acoustic tracks. The first was The Battle of Evermore, a Celtic folk arrangement that features Page playing the mandolin for the first time, while the second acoustic track, Going To California, boasts soothing finger-picked chords played on a Harmony Sovereign H-1260. Since the release of their debut album in early 1969, the chugging bass stylings of John Paul Jones and the barraging drumming of John Bonham had been at the core of Led Zeppelin’s blues-rock sound. Jones maintained the simple set up he had been using for prior albums – a 1962 Fender Jazz Bass run clean into an Acoustic 360 bass head coupled with a 361 cabinet. The band’s fourth album showcased Jones’ skills not only as a bassist but as a jack of all trades – from the softly-picked mandolin in Going To California to the electric piano in Misty Mountain Hop and even a VCS3 synth in the build-up of Four Sticks. Stairway To Heaven also demonstrates Jones’ skills as an arranger, utilising a wooden bass recorder and overdubbing it four times to create the calming counter-melody to Jimmy Page’s finger-picked guitar. Similar to Jones, John Bonham maintained a straight-forward set-up for his unrelenting beats. Making use of a Ludwig kit (including a booming 26″ bass drum), Bonham’s epic drums were recorded, for the most part, with four microphones – two overhead mics, one set up on the kick drum and another for the snare. Bonham also dabbled with unconventional styles in Four Sticks, playing with two sets of drumsticks simultaneously to achieve the track’s flammy quality. Robert Plant’s trademark ear-piercing wails are scattered all throughout Led Zeppelin IV and his vocal arrangements began to grow more complex compared to previous efforts. The Battle of Evermore is the only Led Zeppelin track to feature a guest vocalist, with Sandy Denny taking on the role of the town crier in the song as she and Plant sing soothing vocal harmonies, while tracks like Black Dog and Stairway to Heaven demonstrated dense, multi-layered howls and yelps. 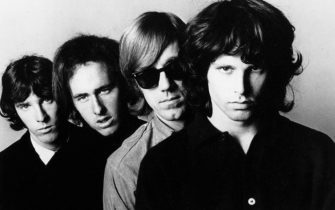 By this time in the band’s career, Plant had stepped up as the primary lyricist and the album demonstrated a slight shift in terms of the band’s lyrical themes. Once again he expressed his love for J. R.R Tolkien with numerous Lord of the Rings references in The Battle of Evermore, while Misty Mountain Hop reflects the ‘free love’ mantra synonymous with the early ’70s. For the most part, songs like Going To California and Stairway To Heaven feature deliberately vague lyricism. As with the album’s oft-debated title, the open-ended nature of the lyrics forces the listener to create their own meaning that adds to the universal appeal of the album. Many tracks on Led Zeppelin IV showcase Jimmy Page’s skills behind a mixing console, but none more than the album’s closer When The Levee Breaks. Originally written by Memphis Minnie, the seven-minute epic is brimming with innovative and unconventional production techniques and showcases Page’s never-ending quest for exploring new sonic territories. To create the thick, sludgy tone for the guitars and rumbling bass, the track was recorded at a slightly higher tempo and then slowed down. It is also one of a few tracks in the Led Zeppelin catalogue to feature Plant on harmonica. During the session, Page recorded Plant’s harmonica take and applied echo while playing the track backwards. This creates a reverse echo effect where the echo precedes the initial recording and adds to the harmonica’s haunting tone. As each verse progresses, Page applies a slightly different effect to Plant’s vocals – be it panning them from left to right or applying some subtle flanging. This is to help stress the narrative of the song and a sense of impending doom. In the final section, Plant’s vocals are heavily processed with a phaser, which creates a warbling quality as he sings “going down now” over and over, indicating that the levee has, indeed, broken. Last but not least, we have those head-banging drums by Bonham. The dense drum sound on the track was created by placing Bonham’s Ludwig kit at the bottom of a stairwell in Headley Grange and setting up two Beyerdynamic M160 mics on the first floor. Andy Johns then applied limiters and ran the signal through a Binson Echorec for that huge reverberant sound. So iconic is the drum sound that it went on to become a classic hip-hop sample, used by everyone from the Beastie Boys to Dr Dre to Ice-T.
For the casual music fan, Led Zeppelin IV is the album with Stairway To Heaven on it – but for die-hards, the album showcases each band member coming into their own. It’s an album that demonstrated John Paul Jones’ diverse musical talents and boasts some of Robert Plant’s finest songwriting. It cemented John Bonham as one of, if not, the greatest rock and roll drummer, and displayed Jimmy Page as not just a beast behind the guitar, but a master behind the mixing console.